First, let me tell you about this Instant Pot craze I’m on. Probably around a year ago I saw blogger after blogger and even a few real-life friends going on and on and on about the Instant Pot Multi-Functional Pressure Cooker. But because I have a small kitchen and not a lot of storage space, I’m always hesitant to buy any new appliances or gadgets – especially things that I will only use occasionally. Also, I’m an avid slow cooker user. So much so that I have 4 of them… one really huge one, two medium/small size ones and one really small one (I use to melt chocolate in for cake pops). I really couldn’t imagine that I needed the Instant Pot. But as often happens with me, I guess I finally let all the hype get to me and back in July there was a really great sale and before I knew what hit me, I found myself ordering one.And then sticking it under the bar and not using it. Fast-forward to December when I was doing a little pre-Christmas decluttering and I came across the Instant Pot under the counter. I made up my mind then and there that I was going to use it or sell it. I wasn’t willing to continue to sacrifice the storage space for something I wasn’t going to use. So I ordered an Instant Pot cookbook online (and within days got another Instant Pot recipe ebook for free on my Kindle) and when I had spare time, I started browsing the books. The first recipe I made was a Beef Stroganoff (using chunks of roast). I was blown away by the fact that the roast went from raw to falling-apart tender and delicious in under an hour. Next I saw someone on Facebook talking about “boiling” eggs in the Instant Pot. So I tried that. It was crazy easy. Then I tried pasta. So, so easy. And it took 4 minutes after pressurizing. 4 MINUTES. Next I cooked chicken breasts… from FROZEN to DONE in 18 minutes. I.WAS.HOOKED. Where in the world has this appliance been all of my life?! Oh and about that storage space? I made a place for it on the countertop… I don’t foresee actually putting it away at all. I might use it every day! Fast forward to today – New Years Day – and I woke up late for church. I knew we were supposed to eat pork, black-eyed peas and cabbage (I don’t know why – I just know that’s “the” traditional New Years Day meal), along with ham, cornbread and greens. But that wasn’t happening. We had already thawed steaks to cook today (not at all traditional) and I had cornbread dressing thawed from the freezer (also not traditional). To try and do at least a little bit of tradition, I had planned to soak black-eyed peas last night and simmer them all day today. But I forgot. About 10 minutes before walking out the door for Sunday school, I thought I’d do a quick check in the recipe book (that came with it) and see if I could do dried peas in the Instant Pot. I was so excited to see I could!! If this is not tradition for you, can you leave me a comment and tell me what your traditional New Years Day meal is? 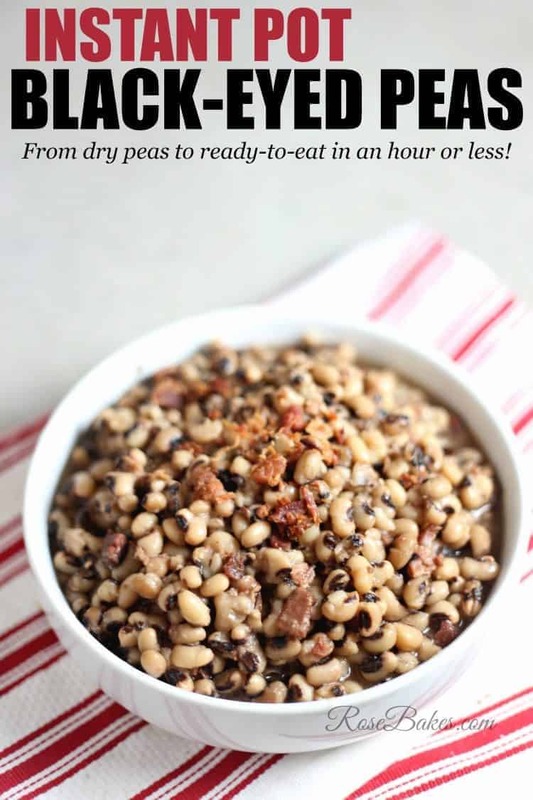 These black-eyed peas are so easy in the Instant Pot! No worries about soaking, scorching, under-cooking, etc! They’re delicious! I let mine cook, then naturally cool (although it will keep warm until you turn it off). They were perfect – no other seasonings were needed!! *We like our black-eyed peas really soft. If you prefer them a little more firm, you might want to cook for 20 or 25 minutes vs. 30. **It will take longer than 30 minutes for them to be ready to eat because you have to wait for it to pressurize and then wait for it to depressurize, but it’s insanely faster than soaking then cooking on the stove the traditional way. I put 50 minutes total “cook time” assuming 10 minutes to reach pressure and 10 minutes too cool. Those times may vary. I haven’t tried any desserts yet – I’ve truly only been using it for a couple of weeks. But cheesecake? I must check into that! I am not a baker at all because of the precision that it takes. However, my IP cheesecake was one of the best I’ve ever had. I am cooking this black eyed peas recipe today with a delayed start so it will be ready when I come home. Thanks for the recipe, Rose! 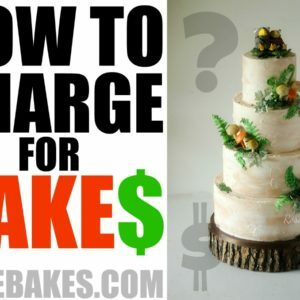 Pat Brook – could you post a link to your cheesecake recipe? I’d love to try it. I think my favorite thing is that there’s no risk of me overcooking the beans, peas, pasta, rice, etc. (unless I set the wrong cook time). And the whole frozen to done thing is a big bonus too… I’m so bad about forgetting to thaw my meat early enough in the day! Rose! This looks wonderful, I had never heard of an instant pot and now I want one to make this recipe! I’m about to use your recipe- it looks wonderful! I got an Instant Pot for Christmas this year and have used it at least once daily since then. I’ve made steel cut oats for breakfast most mornings (3 min cook time! ), black bean soup, refried beans, and will experiment with “real” (entree) recipes this week. I’m also intrigued by the idea of cooking desserts in it! Just wanted to make sure….the 1/2 cup crumbled bacon is cooked before going into the IP, correct? I’m not sure if the saute function was available back when this recipe was posted, but I sauteed my smoked jowl before starting my recipe and I can’t wait to see how it turned out. I also added a can of diced tomatoes, an Anaheim chili, some onion and celery to the dish before pressure cooking. We really have got to get an Instant Pot! I’m loving all the recipes I keep seeing. We do enjoy black eye peas for our New Year’s Dinner but we also eat them all year. So glad you party with us at Merry Monday. Oh wow this sounds like the most perfect black-eyed-peas– if only I would pop a crisp through the screen and take a piece now! I love, love, love my Instant Pot. My husband bought it for me earlier this summer from a recommendation from a neighbor friend, especially since we go camping (great for rv campng!!). 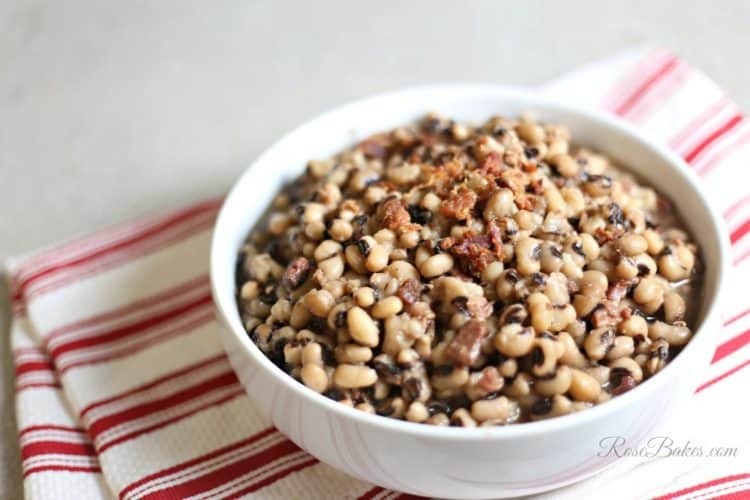 Black eyed peas & cornbread, with some collard greens, are one of my favorite meals. Found your recipe & trying it now, except I sauteed some chopped onion & garlic & added some pepper & salt to the pot, using reduced sodium chicken broth though…hope it’s not too salty. you might not know the answer to this – but do you think you can cook 2 lbs of black eyed peas in a 3 qt IP? The general rule is to not fill your Instant Pot past halfway full. So if you can get 2 pounds of peas in the pot and cover them with sufficient water, then I don’t see why it wouldn’t work. I have an 8 qt… how long would you cook two lbs of peas? I think the coook time would be the same – you’d just need to adjust the water/broth. no, use only 2 cups of the beans or you will go over the fill line and that is a huge no no its the mini I am refering to. I just made this recipe today to go with our New Years Day lunch. They are wonderful! And, you are correct … no additional seasoning is needed! I love my Instant Pots! Today I made honey pork chops in my 8 qt, scalloped potatoes in my 6 qt and black eyed peas in my mini. @Adele Aiken, I made 1 lb peas in my 3-qt (mini) and it was filled to the max fill lin (with no problems), so you def can’t do 2 lbs in a mini. Just FYI. should I adjust the cooking time if the beans I purchased are pre-soaked?? I’m sure it will be less cook time but I’ve never done that so I’m not 100% sure. I was wondering about cooking from frozen peas? 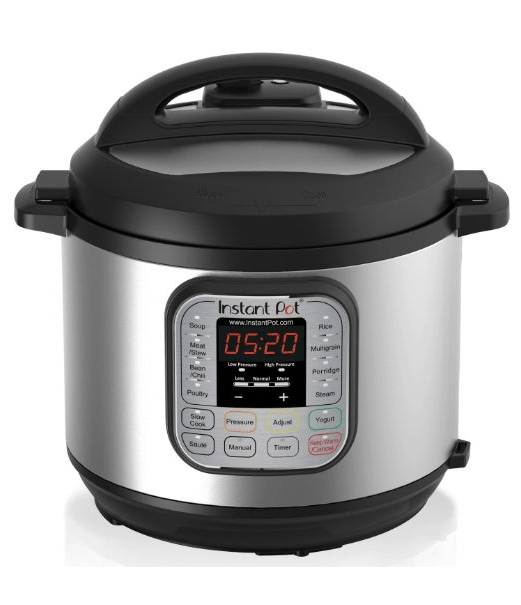 WhT is the length of time in the instant pot? I think the last time I did frozen peas, I cooked them for 8 minutes. I did 8 min today on a package of frozen peas since our store was out of dry beans. Turned out perfect!!!! Very first instapot try! How much water with frozen peas? Same as dry? I usually do about 1 – 1.5 cups of water, depending on the amount of peas/beans. Does the bacon need to be cooked beforehand? It doesn’t have to be, but bacon is not very appealing when it’s cooked in the pot. Thank you! We tried it at 27 minutes, quick release, with the cooked bacon and it was delicious. I’m not 100% sure. I’d make sure they’re covered at least with at least an inch of water above them. If I want to make half this recipe, would I cook for same amount of time? Isn’t the Instant Pot a real time saver! We gave our daughter one for Christmas and she loves it! Pinned this recipe. Thanks for sharing with us at Merry Monday. Thanks Shirley! Happy New Year! if you are using a breville pressure cooker, is it the same time? Hi Heidi – I’m not familiar with that cooker so I can’t say for sure but I’d think it would be the same?! I made these today, practicing for tomorrow just in case. The peas turned out perfect. Tender and tasty. I am in love with the instant pot! The Instant Pot Black Eyed Peas were excellent! Make this! It will not disappoint. I did not precook my bacon. Just cut it into 1”pieces with the scissors. (It was about eight pieces) I also added an onion as I am obsessed with onions. I usually make mine with a ham bone. Do you think you would need to adjust the time? No – I think it would be great and no time adjustment needed! I presoaked mine so would the time be the same? I’m not sure – I’d probably cut the time by 10-12 minutes, but that’s just a guess. Sorry I don’t know for sure! I found out. For prepared black eyed peas it’s 5-6 mins. Good to know – thank you Marie! Happy New Year! You’re not late at all. I just started using my instant pot a couple weeks ago. I’ve only made 3 meals thus far. I’m off to start my traditional meal now. Thank you for the recipe! You’re welcome – Happy New Year! I’d do maybe 4.5 – 5 cups of water/broth. It doesn’t have to be exact! This recipe for black eyed peas came out well. But you definitely need seasoning. I grew up eating black eyed peas for New Years. I knew by reading the recipe what it was missing. I used 4 cups chicken broth and 2.5 cups water. I sautéed 1 chopped onion with the bacon. I seasoned it with salt, black pepper and garlic powder. Then I followed your cooking instructions. It turned out great. About this black bean recipe. I uses it only for the cooking time! For a more tasty, savory dish I sautéed a chopped onion, garlic, bacon, and ham. Add chicken stock and beans. Cook as directed. Oopsie, my post was for black eyed peas, not black beans! Have these in my IP right now just waiting patiently for the pressure to come down so i can open the pot!! 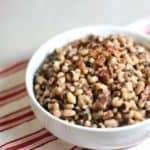 Easiest black eyed peas I’ve ever made. Super excited to try! I just moved South. My sister always cooked black-eyed peas for New Years day while I was visiting, but this year she’s been overwhelmed by work and medical issues and I didn’t know if she would remember. So I decided to make black-eyed peas in my instant pot and bring them over to her house for New Years day. I found two recipes I liked, but yours won because it was in the instant pot and I had everything I needed in the house! It was nice and easy to make too! The hardest part was figuring out how many cups of peas in a pound, since I had a 5 pound bag of black eyed peas I had just bought! Turns out to be about 2½ cups! When my sister heated them up, she thought it might be a little boring(since there were so few ingredients), so she added some crushed red peppers. It was really tasty! 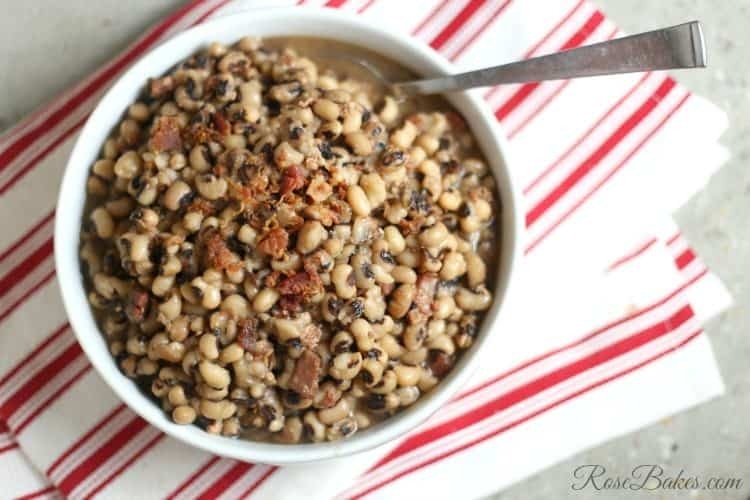 My niece said that these were the best of all the New Years black-eyed peas she’s had! So while you might have posted this recipe too late for 2017, it was great to have for 2018. Thanks so much for your kind comments Joanne! Happy New Year to you as well! I also bought an Instant Pot months ago and it is sitting off in a dark corner off the kitchen. I have been collecting recipes and cookbooks galore, but ever-hesitant to bust it open and give it a try. This black-eyed pea recipe showed up just in time. I fave all the ingredients except the bacon. Can I substitute a piece of smoked turkey? My first time using my new instant pot! Your recipe was great! Thanks so much for helping me get started coming with it and having a success first time. Looking forward to seeing more of your instant pot recipes! Yay!! I really need to start sharing more recipes! Any suggestions on how to add okra to the peas? Nailed the time on this- thanks! The recipe is flexible if you want to add veggies (I added green peppers, onions, & carrots) or smoked sausage instead of bacon. There’s plenty of liquid in recipe for it all. Not only was this super fast & easy, it truly was superior to stovetop. Perfect tenderness. Thanks for stopping by the blog and sharing your experience! Your additions sound delicious! We made this tonight and they were the softest we’ve ever made! We did add two small onions and a healing spoonful of roasted garlic. Very tasty and not to mention QUICK! Thank you! Our tradition is Corned beef and cabbage. But now that I live in the South I can only find Corned beef for a few days prior to 3/17. This may be a dumb question, but… You said you let it naturally cool… does that mean you did the natural release? Or did you do quick release & let it just cool off naturally? Yes, I do the natural release 🙂 But it would also be okay to do the quick release and eat them HOT! I’ve made this recipe a few times now, and it’s great! I do add andouille sausage, and a little thyme and sage. I also sauté a chopped onion and garlic toe. Then add the rest and lock & load! Cook just a few minutes more, since we like our beans creamy. Yum! Thanks for the recipe! Oh yeah, my husband likes to add a little tobasco, too! Thank you so much for posting this recipe. This is the inaugural use of my out-of-the-box-today Instant Pot. Looking forward to having yummy black eyed peas with the hot water cornbread I just learned to make yesterday. The only adjustment I made was to add a teaspoon of onion salt to the water. Hope that doesn’t make it too salty, but I wanted the onion flavor. Again, thank you! Awesome – you’re very welcome! MY IP was sitting in my bedroom for two months. I had some dry black eyed peas in the pantry which I bought a month ago at Sprouts. I found this recipe and since I have never, ever made black-peas(always eat canned) I set out to make these. WOW!! I followed the recipe exactly. Once I dished out a cup I added some jarred sliced jalapenos and some of the juice. Just out of the box delicious. Super tender and creamy. Sounds great, I always put onions in mine can I put them in with the bacon and ham? Glad I read this recipe. I’m fixing it tomorrow. Love this recipe! I make this at least once a month, and my family loves it! I received an IP-Duo instapot for Christmas and I do not see a Manual button on mine. Should I just use the Pressure cook button? I would think yes, but I’m not 100% sure. I would have given this recipe a 5 if salt and pepper had been included in it. Add salt and pepper to taste and it’s just right! Dried beans to table ready in 50 minutes! used veg broth and added onions, carrots, celery. Came out great! I got an insta-pot for Christmas. I made the black eyed pea recipe and it was AMAZING!!!! Thank you so much for sharing!! I am a teacher so these quick recipes really help a tired teacher after work. That’s awesome to hear Lisa! Happy New Year! This came out great! I left out the bacon and added a ham steak cut into one inch pieces.